It was me and Yuye’s 8 year anniversary on Monday since we started dating. In the blink of an eye it has already been that long. We’ve been through so much like most couples would have and on occasions we almost broke up. But we’ve undergone the test of time and survived, that’s what matters and that’s what will keep us going strong. We’ve never really been the type to celebrate such occasions. Most of the time it’s just making a nicer dinner at home while spending more time with each other or dining out at a reasonable restaurant and enjoying each others company but no real surprises or big money spending on presents and fine dining meals. That is until this year. We actually just dined at Jacques Reymond and I’m still bloated from all the food as I’m writing this, but I will blog about that at a later date. 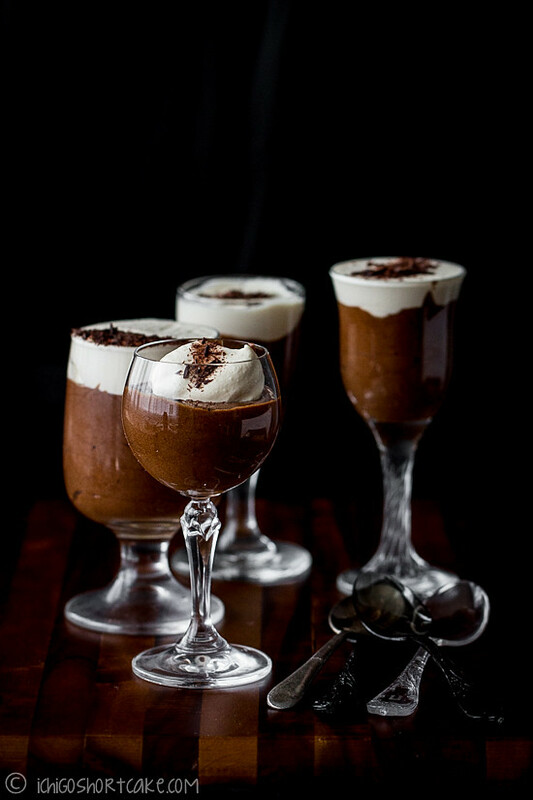 On Monday, I decided to make a decadent chocolate mousse recipe from one of my favourite food bloggers and food photographers – Katie Quinn Davies – which was featured in the July edition of ABC’s delicious. magazine. Katie is such an inspiration to me and many food bloggers alike with her beautiful and vintage looking photography and fantastic styling skills. I can’t believe she does all of that by herself! Since I had most of the ingredients on hand already, when I read the recipe I thought ‘this would be perfect!’ as a celebration dessert. It’s perfect as a dessert for 2 if you make a bit less, or as a party canapé dessert to wow some sweet-toothed guests. The recipe called for Irish whiskey which I didn’t have so I substituted it with the same amount of Frangelico instead. I also halved the recipe as I was having it with just Yuye. It said that the recipe can make 24 while put in small glasses but I think it wouldn’t make as many, maybe roughly 20. Since my recipe is halved, it should fit in roughly 8-10 small shot glasses. Note the Baileys I used was creme caramel flavoured as I realised I didn’t have a large bottle of the regular Irish cream but any Baileys flavoured alcohols would work. 1. Place dissolved coffee, chopped chocolate and butter into a medium sized heat proof bowl. Place bowl over a double boiler, with gently simmering hot water inside. Make sure the bowl doesn’t touch the water. 2. Stir mixture until all dissolved and the mixture is glistening. Take off the heat and set aside. 3. 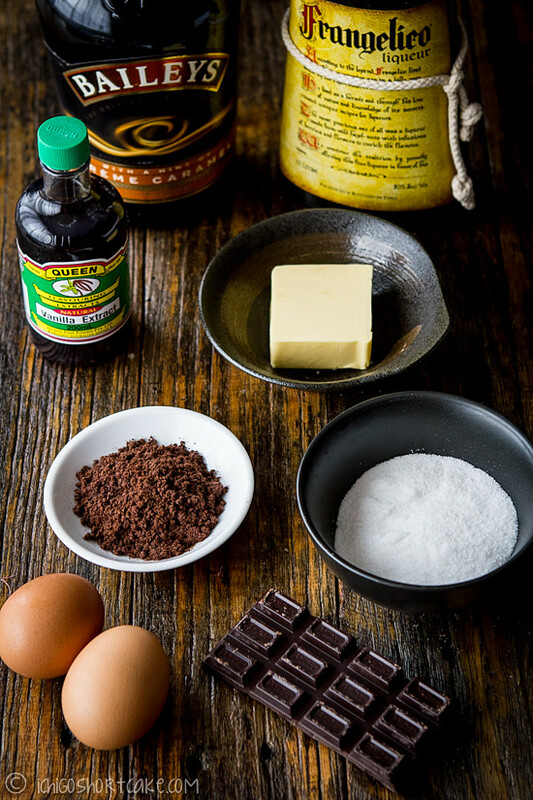 Place egg yolks, Frangelico, vanilla extract, 65g caster sugar and 1/2 tbs of cold water in a large mixing bowl. Set this over another double boiler with gently simmering hot water and make sure the bowl doesn’t touch the water. 4. Using a hand mixer, whisk the egg mixture on high for roughly 3 minutes or until light in colour and thick. Take off the heat and put the bowl in the prepared iced water bath. 5. Continue to whisk for a further 2-3 minutes or until thickened and slightly cooled. 6. Stir in the chocolate mixture until well combined. Remember not to overwork this mixture. 7. Whisk the egg whites in a clean bowl with a pinch of salt until soft peaks form and then add in the extra 1/2 tbs of sugar and whisk until it reaches hard peaks. 8. Gently stir 1/4 of the egg white mixture into the pre-mixed chocolate mixture, then slowly fold in the rest until combined. Do not over mix as this will deflated the aerated mixture. 9. Spoon mousse into small shot glasses (or tall ones like the ones I used), leaving about 1-2cms on the top for the cream. Chill for 3-4 hours or until set. 10. Whisk together cream and Baileys until stiff peaks form. 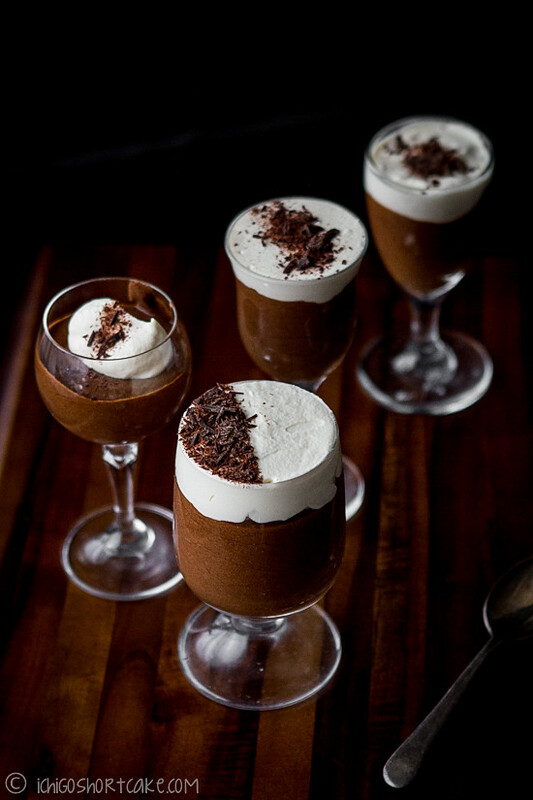 Spoon over the top of the mousse glasses and garnish with grated chocolate. Also garnish with chopped roasted hazelnuts if you have them on hand (I didn’t). Question time: How do you normally celebrate your anniversaries? Is it very romantic full of surprises or just plain and comforting like mine? 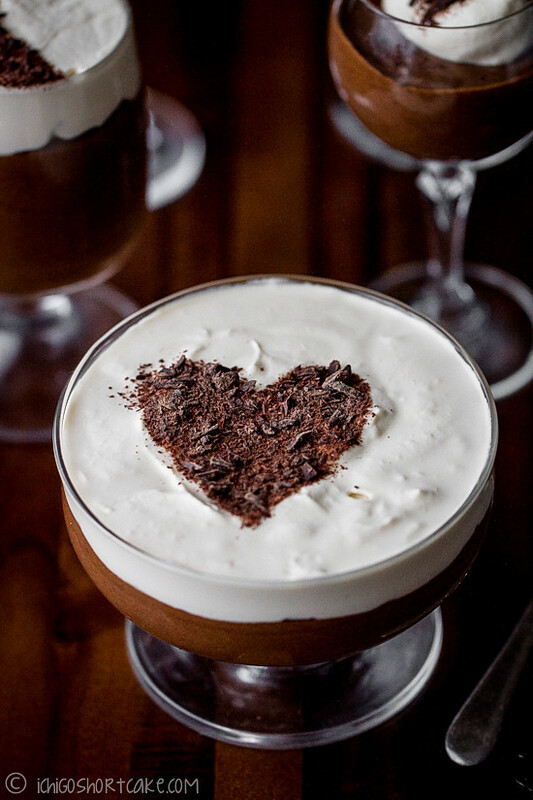 CHOCOALTE + Frangelico… zomg… I’m trying to think of the soonest possible time i can make this! Can I have the biggest glass there? Congratulations! 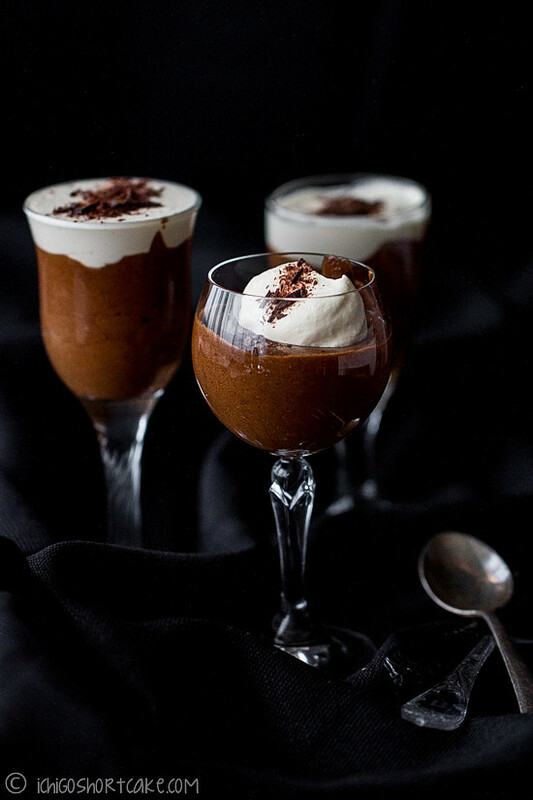 That mousse looks amazing, and definitely a worthy celebration-meal dish! Congratulations! i love chocolate mousse so much! yours is absolutely gorgeous and i love the frangelico in here! Congrats on 8 years! And that looks totally delicious – love all the flavoring substitutions you made. Sounds wonderful. Great pictures too (but I’m a sucker for dark backgrounds). I particularly like the top one and the heart one – and I think having the heart just a bit off center is perfect! Makes a better picture, IMO. Very nice post – thank you. oh my gosh YUM! You had me at bailey’s! And what a perfect moussey celebration! Happy anniversary!!! That is such a great accomplishment. And you chose a fabulous mousse to celebrate with. Boozed up to perfection. Happy Anniversary Jenny! Congrats on 8 years! I think this is my 8th year of dating and 7th year of being married, too. Time flies, doesn’t it. 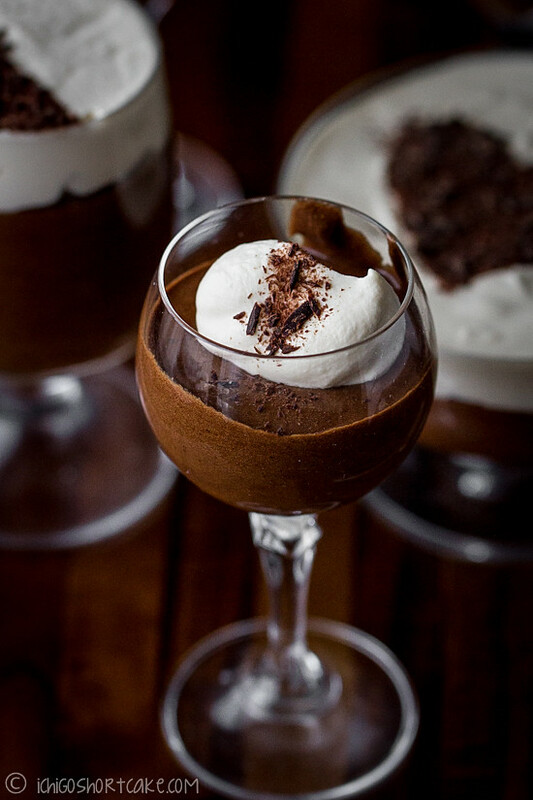 You made beautiful chocolate mousse, and I love how you took pictures of these glasses filled with delicious mousse! Ohhh i love this recipe and would like to say thank you hehe because I have most of these ingredients at home ~ and i have a bottle of baileys that i’ve been meaning to use hehe AND i want to get a bottle of frangelicos hehe yum yum! Eight years is a great achievement, congratulations! This mousse looks amazing, I love the idea of it as a party canape, but if my guests were as greedy as me there would never be enough to go around! Aw, happy anniversary! Here’s to 8 and more years, and more sweetness too! Hi Sittie, the only thing I can think of is to just omit those ingredients. It shouldn’t affect it too much apart from no Baileys and Frangelico taste. If you want a bit of hazelnut taste in it, you can add crushed or finely chopped hazelnuts to the top when you serve. Hope this helps.